Tommy Emmanuel & Rodney Crowell. "Looking Forward to the Past". New Official Music Video. - Newhillbilly website. 100% American Roots Music. 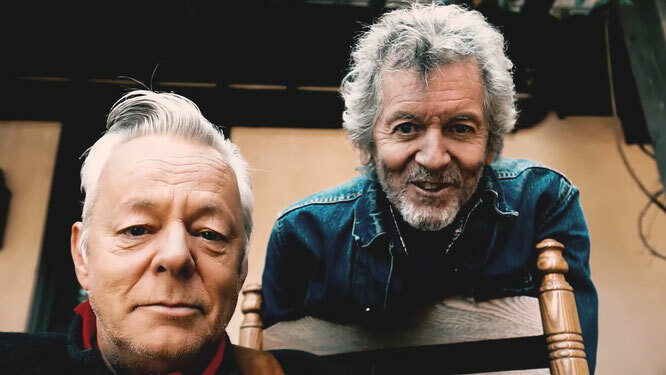 Tommy Emmanuel & Rodney Crowell. "Looking Forward to the Past". New Official Music Video. Tommy Emmanuel has achieved enough musical milestones to satisfy several lifetimes. Or at least they would if he was the kind of artist who was ever satisfied. At the age of six, he was touring regional Australia with his family band. By 30, he was a rock n’ roll lead guitarist burning up stadiums in Europe. At 44, he became one of five people ever named a Certified Guitar Player by his idol, music icon Chet Atkins. Today, he plays hundreds of sold-out shows every year from Nashville to Sydney to London. All the while, Tommy has hungered for what’s next. When you’re widely acknowledged as the international master of the solo acoustic guitar, what’s next is an album of collaborations with some of the finest singers, songwriters and, yes, guitarists alive today. 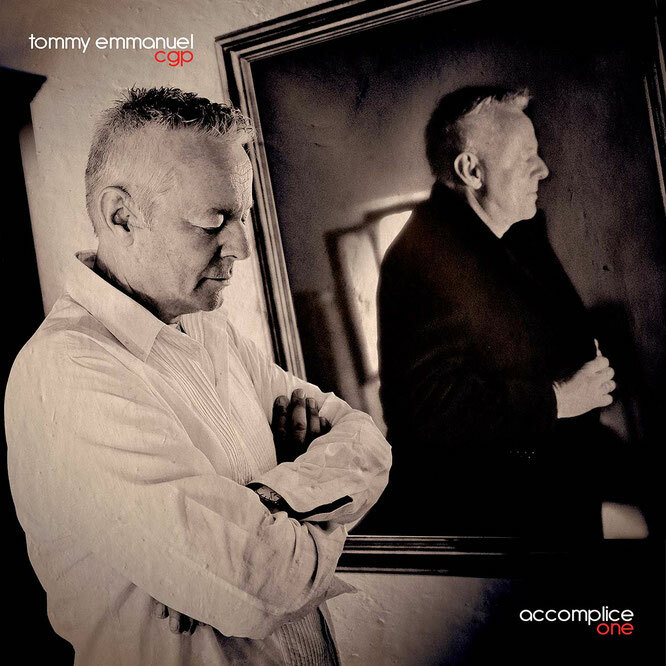 Accomplice One is a testament to Tommy’s musical diversity, the range of expression that stretches from authentic country-blues to face-melting rock shredding, by way of tender and devastating pure song playing. The songs are a mix of new takes on indelible classics and brand new originals from Tommy and his collaborators. The artists who stepped forward to join Tommy in the studio are an impressive list of some of today’s most respected performers, from across the musical spectrum–a lineup including Jason Isbell, Mark Knopfler, Rodney Crowell, Jerry Douglas, Amanda Shires, Ricky Skaggs, J.D. Simo, David Grisman, Bryan Sutton, Suzy Bogguss and many more. This is an album for all types of Tommy Emmanuel fan–from longtime guitar aficionados who’ve followed his career for decades, to lovers of great songs and melodies who flock to Tommy’s shows for the emotional authenticity driving every performance. Grammy-winning singer-songwriter Jason Isbell conjures up the sweaty atmosphere of his Muscle Shoals roots on opener “Deep River Blues,” a classic fingerpicked blues which has been a longtime staple of Tommy’s live shows. Country and bluegrass legend Ricky Skaggs lends his mandolin and unmistakable voice to “Song and Dance Man,” a chronicle of a life lived for the next show. Tommy’s subtlety and tastefulness blends with Amanda Shires’ gorgeous vocal and fiddle playing to transform Madonna’s “Borderline” and Rodney Crowell’s “Looking Forward to the Past” could’ve topped the country charts in another era, with Tommy’s propulsive rhythm supporting Crowell’s sly lyrics while his tasty lead playing weave in and out. For those hankering for virtuosic hot picking, the rave-up “Wheelin’ and Dealin’” sees him trading licks with J.D. Simo and Charlie Cushman, while a jaw-dropping rendition of “Purple Haze” with Dobro master Jerry Douglas captures all the fire and energy of the Hendrix original as the two modern masters push each other to new heights with each raunchy slide and bend. On “You Don’t Want to Get You One of Those,” a sly vocal and acoustic duet with Dire Straits’ legend Mark Knopfler, there was a third, invisible presence in the studio– the late Chet Atkins. While this was the first time he and Knopfler had collaborated, the album also featured some of Tommy’s longtime fellow road warriors, who have covered the miles in buses and planes around the world on tour over many years. “Djangology” is a gypsy jazz treat cut live in Havana, Cuba with Frank Vignola andVinny Raniolo and “Rachel’s Lullaby” reunites Tommy with Hawaiian ukulele master Jake Shimabukuro. The song, written for Tommy’s youngest daughter, shows him continuing to find inspiration from an evergreen source–his love of his family. Since he and his brother Phil taught themselves to play as toddlers, the guitar has been Tommy’s real first language–and he’s more articulate on his signature Melbourne-made Maton acoustics than most people are with words. His unerring sense of groove marked him as Australia’s youngest rhythm guitarist as The Emmanuel Quartet crisscrossed the country. By the time he made it to the big city in his late teens, Tommy was a rock star, slinging a Fender Telecaster alongside the biggest stars of the day. It was a good life, but deep down Tommy knew there was more to his musical destiny. A shy country kid with little confidence, it took an encouraging meeting turned jam session with his guitar hero Chet Atkins to build his self-belief. By the late 80s he was ready to go it alone, to make instrumental guitar records made for an audience broader than just guitar fans–a move with zero precedence in Australian music. Despite the odds, Tommy released a string of hit albums, racking up awards wins and nominations, and becoming a huge celebrity in his home country, culminating in an incendiary performance with his brother Phil at the Sydney Olympics in 2000. Influenced by the Merle Travis/Chet Atkins fingerstyle of guitar picking, Tommy developed a style of solo guitar playing that encompasses the range of a whole band– covering drums, bass, rhythm and lead guitar and a vocal melody simultaneously. No loop pedals, no overdubs, just one man and ten fingers. While some artists take ten-piece bands on the road and still fill out the sound with backing tracks, Tommy builds a complete sonic world entirely on his own. For many players, the technical mastery of the technique would overwhelm the emotion of the music, but not for Tommy. His idols are not just the great players, but also the great pop songwriters and singers–Stevie Wonder, Billy Joel, Paul Simon, The Beatles and their ilk. While thousands of fans have spent years trying to unpack and imitate Tommy’s technique, for him it’s just the delivery system. His approach is always song and emotion first, his music the embodiment of his soulful spirit, sense of hope and his love for entertaining. Which is not to say he dismisses the CGP, the Guitar Player awards, the Grammy nominations, the numerous magazine polls naming him the greatest acoustic guitarist alive. He’s grateful for it all, and the incredible journey that’s led him to the most invigorating period of his career–six decades into it. For Tommy though, the greatest reward is always the same–to make the next great record, and to see the beaming audience at the next great show. Tommy isn’t the kind of man who looks to nostalgia–it’s more that he treats his history in the same way he treats the history of music overall: There’s magic threaded in through all the eras that’s worth celebrating and revisiting. Now in his sixties –although on stage he can seem 25–life and music are about improvisation, variety and happiness.